More than Happier | Because life is better when we do it together. One thing stands out as if it was a billboard. In the 1970’s and before, most of the girls’ toys were miniatures of mom’s tools. There were little vacuum cleaners, brooms, dishes, play kitchens, irons that plugged in and heated up, blenders and ovens that made real food, and baby dolls. Lots and lots of baby dolls, and things to care for them. Little girls, through play, were being taught to be moms, to take care of their homes, and to think of it as play. They were proud that they could copy their moms in their grown-up work. But now, in this world where women are in the workplace, where a woman can be anything she sets her mind to, what are little girls being groomed to be? Doctors? Lawyers? Teachers? Executives? Entrepreneurs? Homemakers? No. It seems, through the marketing of their toys and clothes, little girls are now being led to think they can be princesses. This amazes me. In this world where women want to be empowered, we are teaching our daughters to fantasize about being born into a life where they don’t have to do anything but be beautiful and wait for their prince to come sweep them off of their feet. This seems like it is the opposite of what the women’s movement has worked for all these years. Now, I am by no means a feminist, but I am truly grateful for all the extremely hard work and hardships my foremothers went through to enable the women of my generation to be able to work at something besides housekeeping, teaching, (two professions I love and have done, but aren’t everyone’s cup of tea) and prostitution. They have opened up the world to us, and we are grateful. And I don’t think there is anything wrong with little girls dressing up and pretending to be princesses. I think it’s adorable and fun. And I think it’s endearing when a daddy calls his daughter “Princess”. And since I have never raised a daughter, or had a granddaughter (yet), I have no first-hand experience to say that Disney is really taking over. This is just what I observe in the general public and in the stores. And for some reason, it’s bothered me enough to share it here with you. So what do you think? Are my observations anything to be worried about? Is commercialism dictating how our children play? Are little girls pretending to be princesses over everything else? Are they still playing mommy and teacher? Do they pretend to be a builder with Legos? Do they still pretend to make dinner for their baby dolls, and clean up their toy dishes afterward? Picture yourself as one of Jesus’ disciples. You’re sitting around a friend’s house for a meal, and a woman you know, Mary, the sister of Martha and Lazarus, comes in. Without saying a word, she stands before Jesus, takes out a very expensive bottle of perfumed oil, breaks it open, and pours the entire bottle over Jesus’ head. What goes through your mind? Most of Jesus’ disciples were men, that may be why they looked at the situation from a common sense point of view. They just heard Jesus tell the rich man to sell everything and give the money to the poor, and here Mary has just wasted a year’s worth of wages by pouring it over Jesus’ head. It’s no wonder that they berated her for such an action. Think how much that could have done for the poor! Isn’t this what Jesus was going to tell her? But they were wrong. Jesus always looks at our heart. And He could see she was focused solely on Him and what she could do for Him. He could see her need to show Him her love. Jesus knew she was doing this because she believed every word He said about His upcoming death, that He was dying for them, and she had a deep need to thank Him. When I read through the Bible, I always find verses that echo what I’m thinking, how I’m feeling, what I need at the moment. This verse, Revelation 3:2, kinda freaks me out, because it reflects a deep feeling I’ve had in recent months that I haven’t been able to put into words, and at the same time helps me answer a question we had last week in our small group Bible study. We’re doing a study based on Francis Chan’s book Crazy Love. The study guide asked, “If today was the day you died, what would you regret, and why?” Revelation 3:2 answers that question for me in three ways. Regret #1 – To find I wasn’t paying attention, and that life could have been so much better if I had been. Have you ever started to tell someone something, and they assume they know what you’re going to say so they jump in with their opinion, and it’s not at all what you were talking about? I think God’s plan for our individual lives might be like that. He starts talking and we’re all, “Okay God. I see where you’re going. I’ll take it from here.” Maybe He’s trying to tell us to stop and listen, because that’s not what He was going to say, and He has a better way. Everyday since this thing started, I’ve checked my Facebook page, sort of peeking through my fingers at my Notifications to make sure no one had nominated me to take this challenge. The funny thing is, as much as I hoped no one had, another part of me kinda hoped someone had. I didn’t want to have a bucket of ice water poured on my head. Nope. Uh uhn. But I wanted someone to like me enough to name me. You know, that I was at the forefront of their mind when they did their own challenge and thought, “Now, who would fun-loving enough to go along with this?” All the while, still hoping to avoid it. Crazy, I know. But here we go! My son Jordan has challenged me. That surprised me, and made me happy. He challenged me and a group guys he grew up with. Somehow, that made it even more special. Sort of, “My mom is as cool as my friends” kind of special. In his mind, it was probably more about his love to prank me, but let me just have my dreams. And of course, if my baby boy asks me to do this, I have to do it! So here it is. I’m not going to nominate any readers (unless you are Dan, Debbie, or Janet, as I mentioned in the video). I’ll leave that to those that know you and love you. And don’t think you can hide. This thing is lasting way longer than I thought it would. No one is safe! We have a fig tree in our backyard. 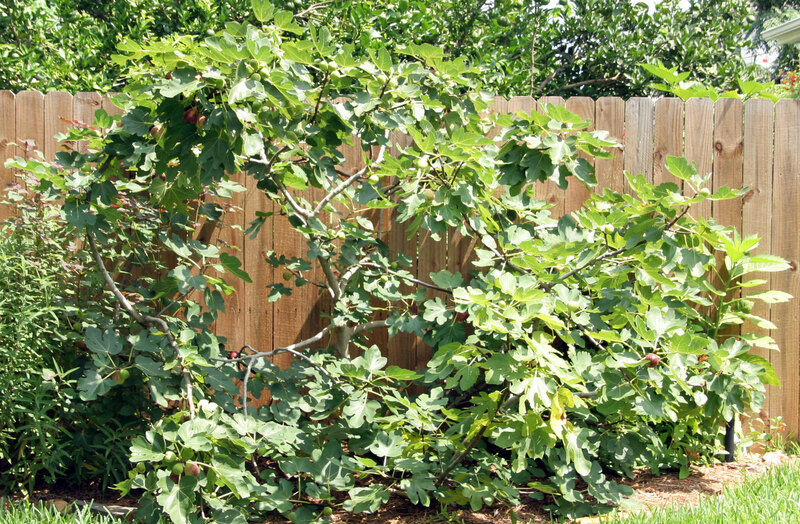 It’s a wide-spreading, large leafed, Brown Turkey fig tree. We grew it from a cutting taken from my father-in-law’s tree. His grew his from a cutting taken from his mother’s tree. Someday, I hope my sons have their own fig trees, grown from cuttings taken from our tree. It’s a lovely tradition to cultivate a new generation of this heirloom tree to each new generation of our family. Our third generation fig tree, popular feeding destination for our mockingbirds and cardinals. Right now, we are in the midst of fig season. This is the first year that we’ve had enough rain to give us a good crop of these delights. Dan has been harvesting them in the morning and again in the evening, bringing in five to 10 each time! I’m giving them to friends, and putting them in smoothies, and trying to find as many recipes as I can to keep up with production. This baby is ripe and ready for picking! 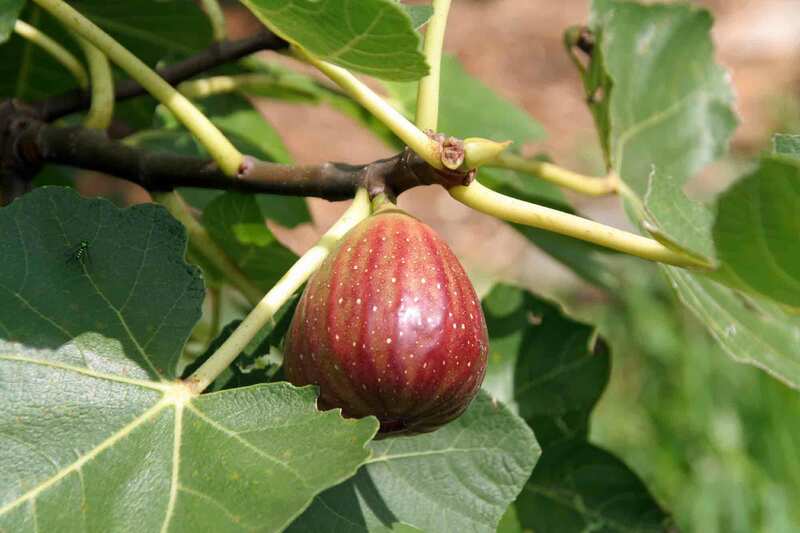 Figs go well with cheese, nuts, bread, in cereals and salads, and on the grill wrapped in bacon. 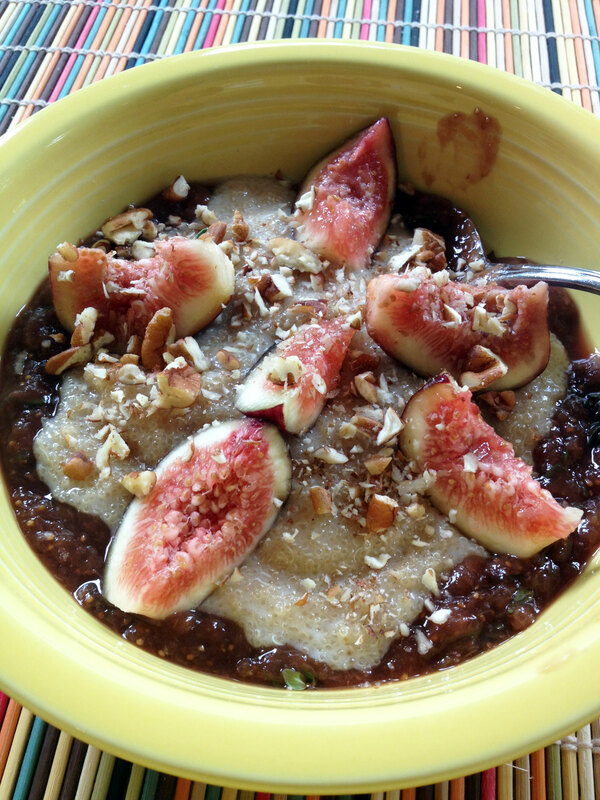 There are so many things you can do with figs! 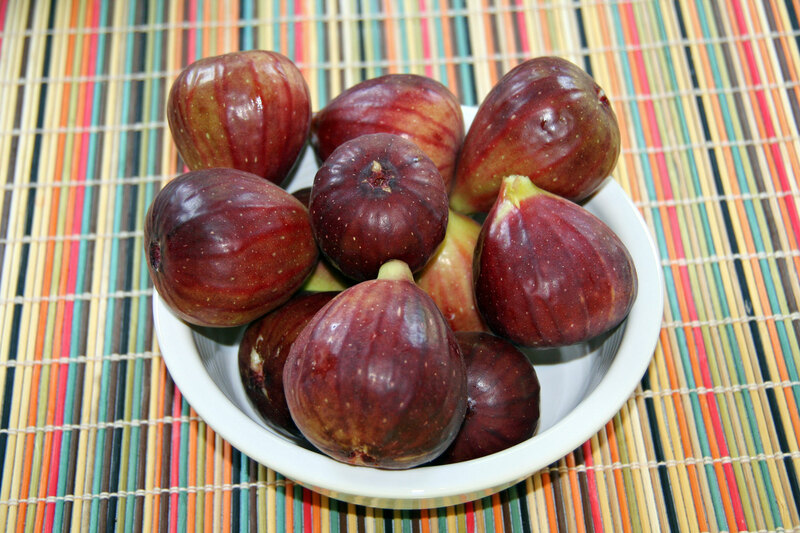 I’ll share with you some of the recipes I’ve been making with our figs. 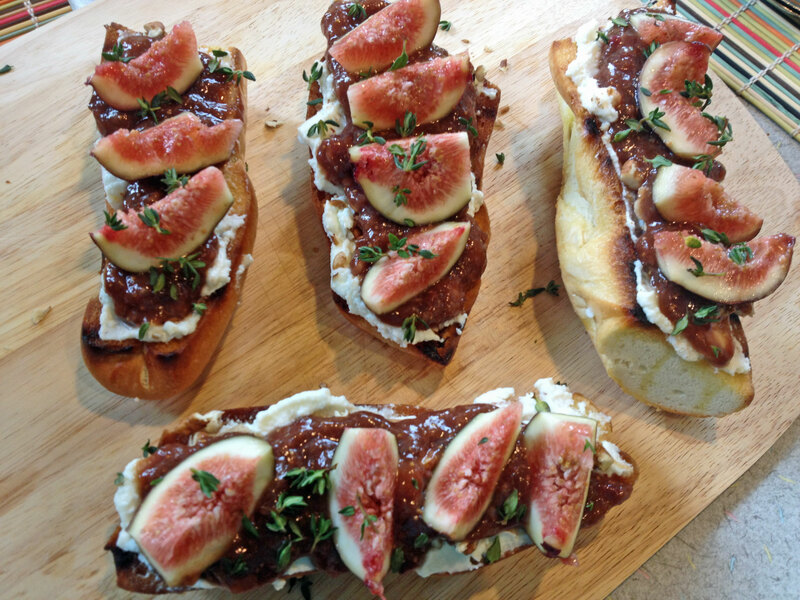 Today’s tidbit is this luscious recipe for Fig Bruschetta I found on WhiteOnRiceCouple.com. It’s worth a click to just take a look at the gorgeous photos there. Please visit them and try this recipe for yourself. Ooohh, this was so good! Figs light sweetness is wonderful in combination with the flavors of ricotta, pecans, honey, and thyme. After we had eaten our fill of the bruschetta, we still had some of the fig puree, thyme, chopped pecans, and chopped figs left. I saved them for breakfast and mixed all that into bowls of creamy amaranth made with coconut milk. Yum-my! Amaranth is an ancient grain that has more protein, iron, magnesium, and calcium than most grains. It’s a little pricey, but one cup dry makes three cups prepared! And you can pop these tiny grains like corn! Today I’m making fig and blueberry nondairy ice cream. Should be dreamy! I’ll let you know.